The Argentinian motor tanker Victoria, attacked north of Bermuda by U-201 under Adalbert Schnee on 18 April 1942. Her neutral markings are clearly visible in this photograph. The neutral Argentinian motor tanker Victoria was built by Cargill Incorporated in Albany, New York, in 1941. The ship’s owners were the Cia Argentina de Navegacion Mihanovich Limitada of Buenos Aires. She was originally built as the Carlantic for Cargill however sold to the Argentinian interests upon completion. Victoria’s master on this voyage was Captain Felix G. d. Salamone, who was purported by his fellow crew to be pro-Nazi to the extent that he believed only a British or American submarine would attack them, and never a German. Despite this he proceeded at night with lights doused. There were 39 men aboard the ship: 29 Argentinian officers and crew, six Spanish, three Portuguese and a single American. F. K. Troughton was a riding engineer, or Guaranty Engineer for the machinery manufacturer, Fairbanks Morse and Company. The Victoria loaded a cargo of linseed oil in Buenos Aires and sailed on the 14th of March 1942 for Rio De Janiero, then called at Recife Brazil on her way to New York. When the Victoria was attacked on the evening of Friday April 17th she was 325 nautical miles northwest of Bermuda roughly halfway to New York, which was a further 335 nautical miles along the track to the northwest. At the time of the first attach the Victoria was heading at 311 degrees north northwest at 8.5 knots. The neutral Argentinian flag was flying and the words “VICTORIA BUENOS AIRES” were prominently painted on her sides and it was dusk but sufficiently light to read. At 6:46 pm local time the sound of “metal on metal” according to Troughton rang out. The ship had been hit by a torpedo fired by the German submarine U-201 under the command of KorvettenkapitänAdalbert Schnee. There was a “heavy blow” at the bow on the port side roughly 30-40 feet from the bow, between tanks numbers one and two. A large geyser of water shot up and the ship was said to have “shuddered from stem to stern”. The impact is believed to have hit 10 feet below the water line. Some small holes punctured the deck but did not wreck the railings, and some of the deck was buckled. According to Troughton the bunker tank must have been hit as roughly 200 tons of oil emanated from the puncture in the hull. Captain Salamone ordered the starboard lifeboat lowered, an SSS sent, the engines stopoped and the general alarm sounded (the SOS was answered by “a Washington station.”) The ship fell off to starboard and drifted to the southeast about one mile. By some accounts one of the boats abandoned ship before any other torpedoes hit. 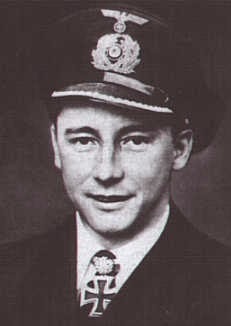 U-Boat commander Korvettenkapitän Adalbert Schnee of U-201 which attacked the Victoria. At 7:45 pm local time Schnee fired a second torpedo, this one a more technically advanced G7e missile, which hit just behind amidships between tanks number six and seven. It was still daylight or dusk, and the generators were running illuminating the ship brightly, though the main engine was off. This explosion was about eight feet below the water line. It produced a “dull yellowish-brown flame …which was extinguished by the huge geyser of water which shot up.” The impact tore the hull for two to three feet above the water line. There were some buckled deck plates and the railings were bent. Whether a single boat had already abandoned, after the second explosion both boats were launched and clear of the mother ship with all 39 men on board. These boats drifted apart. Two days later, at dawn on Sunday the 19th of April the first boat was spotted by a British merchant ship, the Empire Dryden. 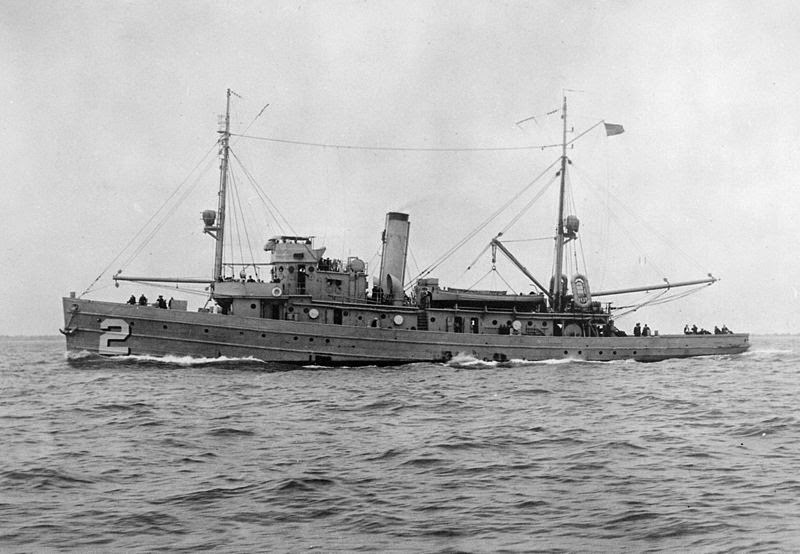 This vessel, under command of Captain Robert Powley, was about to pick up the Victoria survivors when an American naval minesweeper/tug, USS Owl (AM 2), arrived on the scene and insisted on picking up the 21 men and bringing them back to the Victoria. Apparently the USS Owl, while towing the small oil barge YOG 38 towards Bermuda was attracted by the well-lit-up Victoria drifting unmanned on the high seas seven hours after U-201’s second attack. This would have been about 3:00 am on Saturday 18thApril. She sent a boarding party of eight men who tried to re-start the main engines but could not. They found a fuel transfer pump still pumping oil from the bow to the aft tanks, where they overflowed into the bilges. Fortunately for them Troughton was among the survivors, and he was able to oversee the re-starting of the main engine. By 5:00 pm the Victoria was back on her way towards New York. By this time two US Navy destroyers were sent to assist the convoy: USS Nicholson (DD 442) and USS Swanson (DD 443). The USS Nicholson was able to pick up the men in the second lifeboat at 10:10 am on Monday the 19th. This lifeboats was destroyed by gunfire and the 18 men in the boat returned to the Victoria and their shipmates by 7:30 pm the same day. USS Owl which oversaw the rescue of the Victoria, imperiling its own tow in order to do so. The USS Owl was relieved of her duties on Monday the 20th of April by the US Navy tug USS Sagamore, AT 20, and the convoy arrived in New York the following day, Tuesday the 21st. They proceeded to the Bethlehem Steel Shipbuilding yard at Mariner’s Harbor, Staten Island. There workers discovered the same type of copper wire in tanks numbers one and seven as the crew had found on deck after the explosion. Captain Salamone and his officers tried to argue that their ship had hit two mines, or that the copper wiring was evidence of an Italian or Spanish torpedo, but neither explanation stood up to scrutiny. The repairs to the Victoria cost the United States War Shipping Administration (WSA) half a million dollars, and the Argentinians were not quick to pay their share. The case rambled through the halls of diplomacy and across the desks of many lawyers and JAGs. Finally the WSA requisitioned the Victoria on the 24th of July 1942. She was renamed M/T Culpepper, flagged to Panama, and went back to see under her new colors on the 31st of July 1942. She survived the war and in 1961 was converted to a commercial barge.